With its $50,000, the church has managed to cut back two pews and put in one curbcut. No sign of any bathroom construction, and I’m trying to find out why. In the meantime, due to poor planning on my part, I had to use the Evil Inaccessible bathroom yesterday. It’s only an injury to my dignity to teach a colleague to do a standing pivot transfer into the narrow stall, but when I was trying to use the poorly placed grab bars, my elbow slipped between the bar and the wall. While I was trying to extricate my elbow, I fell off the toilet, so now I’m hanging from the damn thing by my elbow, with a nicely wrenched shoulder. I was, of course, rescued by my colleague, who did not injure her back. That place is a menace. 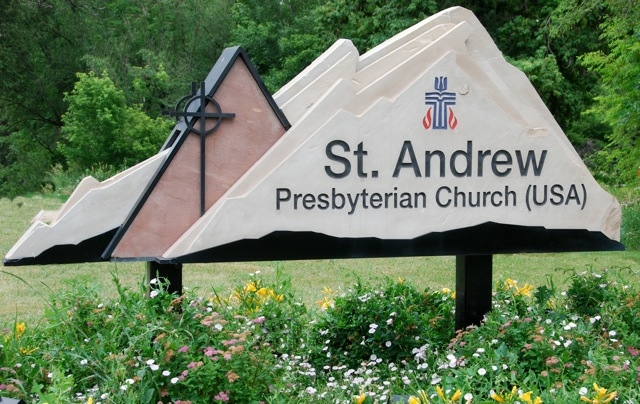 And since I’m feeling not so friendly about this, I will tell you that this heretofore unnamed church is Saint Andrew Presbyterian Church, Boulder Colorado, the Rev. Dr. Stan Adamson, Pastor. Lord, give them compunction, and give it to them now. You know, it’s things like this that make me realize that our entire society is ill-prepared for The Coming Aging of The Baby Boomers. My husband’s grandfather had to get around in a wheelchair for a few months when he broke his hip, and it was a struggle to complete what had previously been a simple outing to see a football game at a major university. It baffled me that the stadium wasn’t more accessible – don’t they understand that their fan base and their donors with deep pockets are aging and experiencing change in mobility? My mom has difficulty getting around now because of knee problems – a fairly common condition that’s only going to get more common – and yet everywhere we go there are stairs and a lack of curb cuts or gently sloping entryways to establishments. She doesn’t shop much anymore. My right hand really hurts some days from osteoarthritis and just trying to pump gas or wrap my hands around some door handles can be painful. Why isn’t any of this common sense to design and build for? Why isn’t there enough deand for these kinds of changes to existing structures to drive prices down? Katja, you have a phenomenal patience to keep effecting change with a clear head and calm attitude. Katja, yer welcome, I guess… but I wish to heaven that the fights for accessibility were “only” with Mervyn’s and city halls. Christians forget too easily how important accessibility of various kinds was to Jesus in his ministry; he was willing to have a roof taken off, so why won’t we do the right and simple things of a few curb cuts and the like? And why won’t we do those things with the humility and urgency of repentance, instead of with some misbegotten pride of achievement? This is a matter of witness to the world and especially to the children who grow up in these spiritual homes. What we do matters right now in establishing a baseline for the next generation of faith. Whom will they include and how automatically will they do this? Or will they, too, require affirmation and reinforcement for doing what should have come naturally and obviously? Faith is “caught” more than taught, and the contagious values in this situation worry and sadden me very much. Patricia, thank you, both for your kindness and your support.